The Owens Valley, its bordering mountain ranges, and diversity of geologic features–some due to faulting; some to glaciation and erosion; some to volcanic activity–engender a number of transition zones between biological communities and varying habitat for at least 33 reptile species. Whereas desert horned lizards (Phrynosoma platyrhinos) tend to linger on warm, sandy flats on the valley floor, sagebrush lizards (Sceloporus graciosus) are far more common at higher elevations, in piñon woodlands on both sides of the valley. 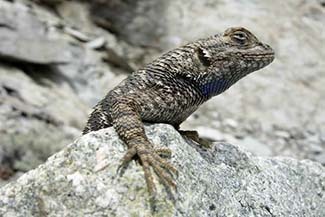 Great Basin collared lizards (Crotaphytus bicinctores) favor rocky areas slightly above the valley floor that offer adequate display opportunities for males without requiring complex climbing skills. Male desert spiny lizards (Sceloporus magister) patronize large boulders, but can also be seen on summer mornings doing push-up and bobbing displays at the top of wooden fence posts on the valley floor. Long-nosed leopard lizards (Gambelia wislizenii) lie in wait for prey in mixed habitats with low-growing shrubs for shelter and open areas for basking or hunting, whereas Great Basin whiptails (Aspidocelis tigris tigris) tend to move constantly. Both long-nosed leopard lizards and Great Basin whiptails can be found at multiple elevations throughout the valley and on alluvial fans of the Sierra Nevada. All of the preceding species are diurnal, but look for the western banded gecko (subspecies Coleonyx variegatus variegatus, or desert banded gecko) with a flashlight. A nocturnal species, C. v. variegatus lives in the southern portion of the Owens Valley and is the only gecko known to do so. Although most snake species in the Owens Valley tend to be nocturnal, king snakes (Lampropeltis getula) and gopher snakes (Pituophis catenifer), including a pink or tuff-colored phenotype as well as a more common tan phenotype, bask at all hours on the valley floor and alluvial fans during early summer, particularly in meadow areas. 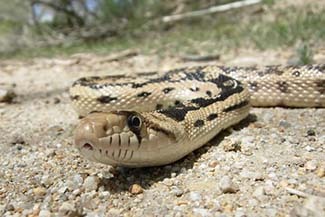 Sidewinders (Crotalus cerastes) can be found in sandy flats, particularly at the north end of the valley in the Volcanic Tablelands. Panamint or speckled rattlesnakes (Crotalus mitchelii) are common on low alluvial fans on the east side of the Sierra Nevada. Less commonly, rubber boas (Charina bottae) can be found close to alkali meadows at the northern end of the valley. To read more about Owens Valley reptiles, see Clarence Hall’s (editor) Natural History of the White-Inyo Range, Eastern California or look up Inyo County species and habitat photos at the California Herps web site.